Want to win some prizes? I’m giving away 20 PRIZES in my FALL GIVEAWAY to celebrate the release of Game Changer, the kickoff for my Ruled Out Romances set. To enter my Fall Giveaway, you can do any or ALL of the following (for up to 11 entries). Just let me know in the comments which ones you do (or have done already) and I’ll add your name into the drawing that many times. Vote for Game Changer on the Reader’s Choice Awards at TKPublishing. This Giveaway will end at midnight on October 31, 2017. Halloween night! Ooooooo! But there aren’t any tricks…just treats! I’ll notify winners by email (please leave that in your comment if I don’t already have it) on November 2nd. Good luck. Enter as many times as you are able. Happy reading! Fabulous giveaway, Charissa!! Let’s see here, I’ve done almost all of those things listed except two, but I feel like I should let some of your new fans win. I’m already a fan–I don’t need to win anything!!!! Good luck, everyone! You are the best! But I’m still entering you. I am following you in Amazon and also on Bookbub, signed up for your author newsletter, voted for Game Changer and shared on Twitter. Thank you for this awesome giveaway! Great! Have you down for 5 entries. Wow, lots of great prizes! I’ll go spread the word on Twitter. Thanks, Carrie. I wish I was as good at Twitter as you are. You have that one down well. At least you have one of them down. I’m terrible at them all. Not true! You’re an awesome blogger. You keep up with yours. I let mine languish. I don’t mind blogging (at times). Sometimes mine languishes as well. It’s definitely evolved from my beginnings and has more book reviews. But I really like reading, so I guess that fits me. Awesome. Thank you. I put you down for 5 entries. 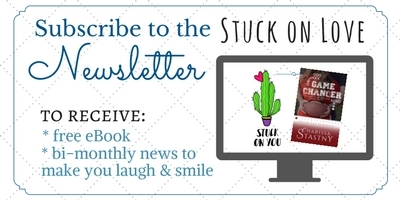 I followed you on Amazon and Bookbub, subscribe to your newsletter, voted for you, and shared the giveaway at https://www.pinterest.com/pin/334321972330582109 . Whew! Awesome. I’ll put you down for 5 entries. Good luck. Follow on Amazon, BookBub and a subscriber. I follow on Amazon and Bookbub. I am a subscriber. Okay, I put you down for 3 entries. Follow on Amazon & Bookhub, signed up for newsletter, & shared on Facebook & Twitter. I follow you on Amazon, I already receive your newsletter, I’m following on Bookbub, I shared on social media at https://pinterest.com/pin/54958057937268969/, I’ve reviewed Between Hope and the Highway, and I voted for Game Changer! Awesome. I have you down for 6 entries. Julie, I need your email to send you your prize from this giveaway. I follow on Amazon, follow on Bookbub, already signed up for your newsletter. Thank you. I’m already following you on Amazon. I’m now following you on BookBub and I signed up for your newsletter. I also voted for Game Changer on TKPublishing.